Our grand adventure into the largest, and one of the oldest, player-run community on Baja, began by meeting up with our gracious host, Grand Duchess Wildstar. Wildstar explained that the Kingdom of Dawn began as a small guild known as the “Guardians of Virtue” back in the early days of the game. 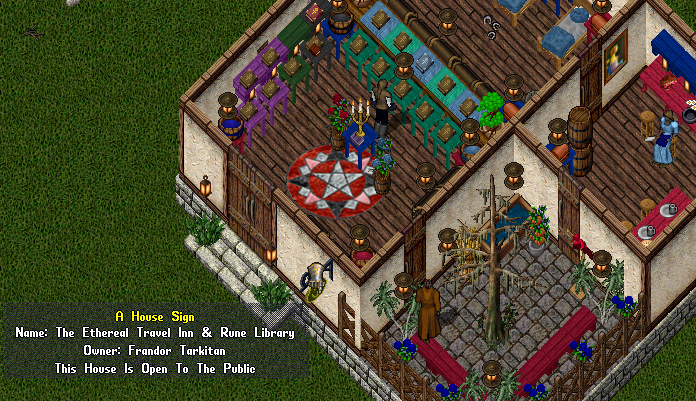 The Guardians of Virtue guild grew into a community, and in 1999, became officially known as the Kingdom of Dawn. 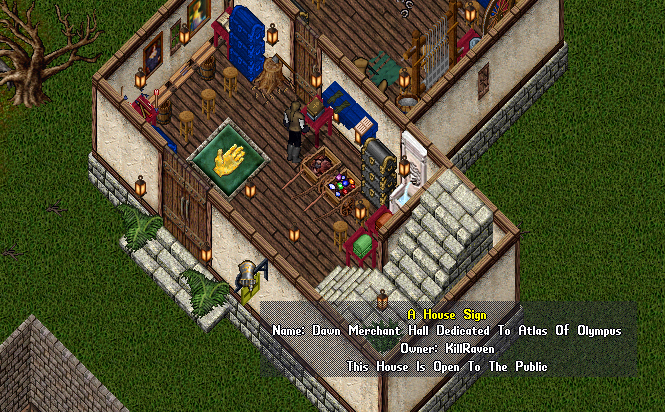 Role players of all types have made the Kingdom of Dawn their home. From saints to murders, all were welcome. 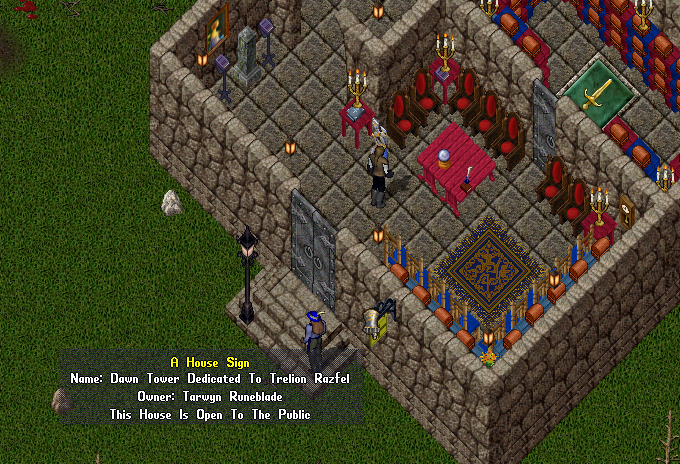 This spirit of welcome continues to today, the Kingdom of Dawn’s dedication to role play and its preservation of its unique history embodies the very soul and spirit of Ultima Online itself. The Kingdom of Dawn can be located in the lands wrapped around the dungeon Wrong in Felucca. Most of the Kindgom is east of the dungeon, but some new additions west of the dungeon have enlarged the borders of Dawn until it nearly surrounds the entire mountain range. 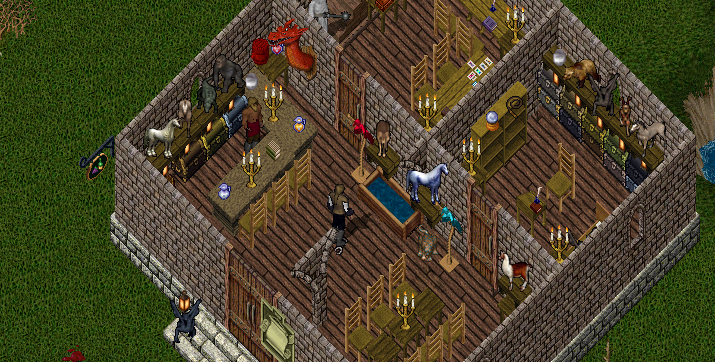 Dawn is made up of diverse buildings, from the smallest of the classic buildings to the classic keep, to custom buildings with very creative designs. Some of these buildings are grandfathered, and could never be replaced in their current formations. 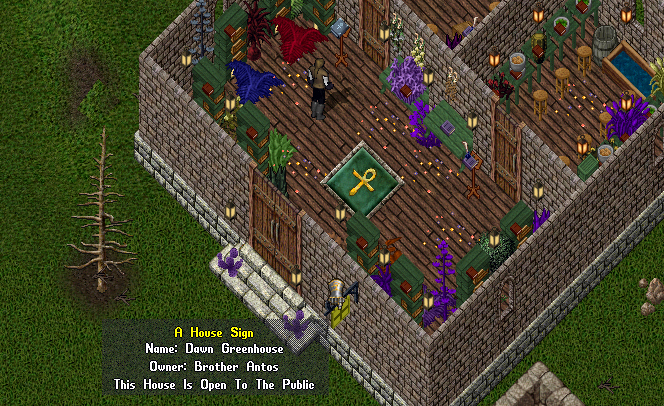 Each building in Dawn is ingeniously decorated to enhance its function, most containing rare items, artifacts, and objects with a unique history. Much of the kingdom in its current state was decorated by the Grand Duchess Wildstar, whose designs are the definition of creativity. One could spend many hours exploring the many interesting corners of Dawn, without seeing everything there is to see. Some of the highlights of our tour included the Dawn Museum of Dreams, the Dawn Tower, the Royal Palace, the Orc Furt, and Dawn Library and Merchant Hall. Visit the Kingdom of Dawn Forums to get in touch with the Dawn community! The First stop on our tour of the Kingdom of Dawn is the Dawn Tower. 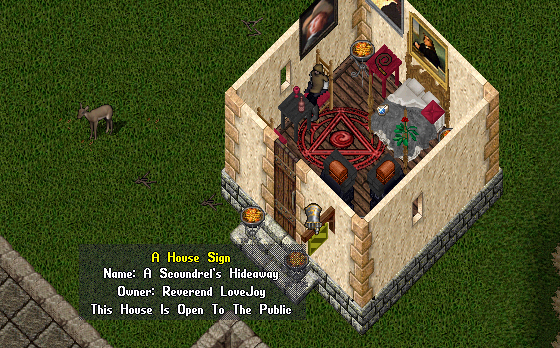 Here, you will find the guildstone for The Kingdom of Dawn in this building. This is also where guild and Royal Council meetings were held. On the roof, we held the tournaments for King’s and Queen’s Champion in which guild members fought each other for the right to bear either title. The winners held the title until the next tournament. Noah the Crier is on duty 24/7 and is a gift from the Seers. The tower used to have a stable master was well, but he left his post long ago. Next we will see the Royal Palace! This is the residence of the Royal Family – King Desmond Cross, Queen Hayloh and their son, Prince Riain. The King & Queen are away on a long journey, but you can find the Prince in Dawn when he is not busy with his studies or training. The family lives in the front part of the keep while the rest is used for official purposes. We were able to save the remains of the Terdeus Hall Library which you will find in the building. It is being carefully studied for any clues about Dark Tower or its intentions that can be found. 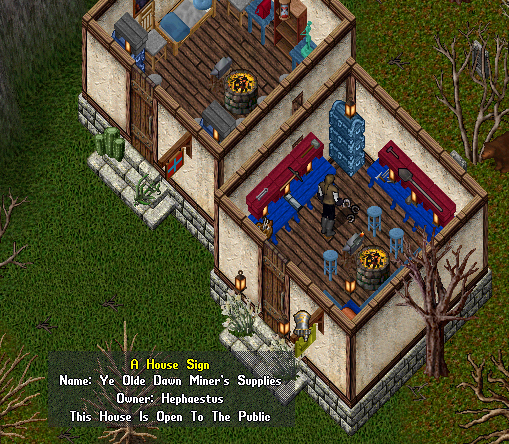 We have had several taverns in Dawn’s history, but the one I like the best was this one, so when a house collapsed on the day of the Open House in 2008 I took the opportunity to bring it back and to expand Dawn. 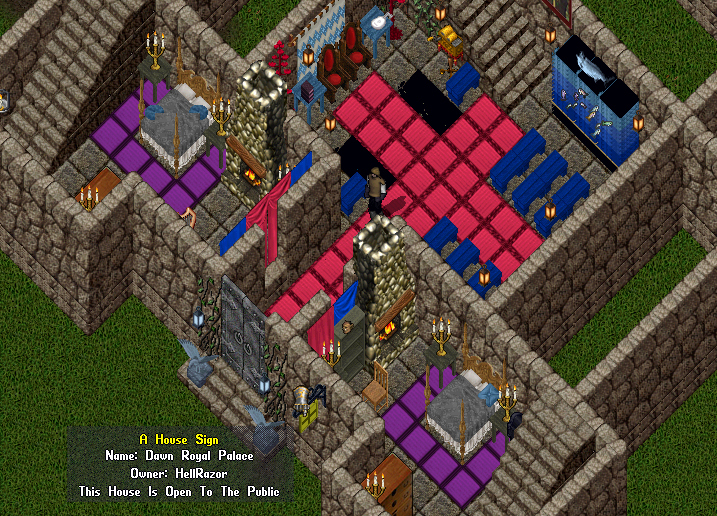 Due to current circumstances with Lord Casca, it has been renovated to add a barracks and a watch tower. This is a functioning greenhouse. Brother Antos, the Arch Bishop of Dawn, tends the plants here. You will find plants with all three labels in the small crates along the walls in the front room. Brother Antos’ goal is to have a vibrant version of each plant currently available in-game and he is making some good progress on that, so when you return please check to see the new additions to the greenhouse. Each crafter has its own area in this building to comfortably practice their skills – Blacksmiths, Tailors and Woodworkers on the first floor, while the Alchemist, Chefs and Scribes have theirs on the second floor. We have several historic runes that go to player-run cities or buildings that no longer exist, but we did not have the heart to destroy them. One example is a rune to the original Dark Tower building which was located in Felucca. Near the rune library is the Dawn Museum of Dreams. Stepping inside the Dawn Museum of Dreams the first thing you will notice is the clever GM statue designed out of red and gold bandages. The GM statue is an example of the ingenious way that the people of Dawn have used everyday objects to create unique art. The Museum of Dreams houses a uique and eclectic collection of rare items, some that can be found nowhere else on Baja. Throughout the museum, there are books explaining the history and origin of the various rares. 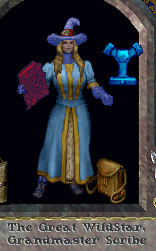 Special collections inside the museum include: “Treasures of the Implementors” a collection of GM created items, “The Ethereal Chamber” a collection of magical themed rare items, “The Royal Kitchen”, “The Armory and Workshop”, “The Slaughter House” and “Oceania”. The museum is a delightful way to spend many hours examining strange and unique items while learning a little history. The beautifully rustic building is the residence of the Gulguth Orc Clan which was recently come to the Kingomd of Dawn. Its very existence stands as a testament to to the fact that all kinds are welcome withing the kingdom. The furt was decorated by its human caretaker Sam, who has ensured that its comfortable for both its inhabitants by including a library of Orcish books (who knew they could read?) as well as workshops, comfortable bedrooms, and an open air kitchen complete with Orcish recipes. Barbequed horse anyone? This small house is the home of a thief who happens to live in the Kingdom. Note: This is best viewed at night. Those two buildings house the Royal Navy of Dawn – the sailors and fisherman & women of Dawn. The house on the right displays older salvage items, while the one on the left displays the newer items. Both of the buildings are the old classic pre-built forge houses. 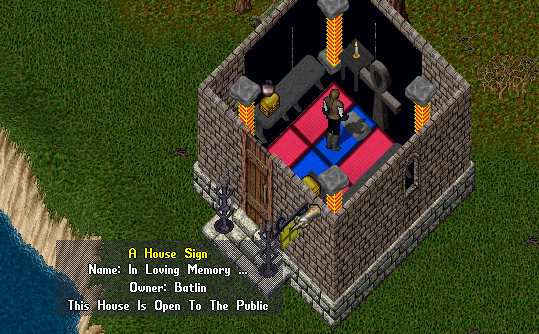 Please note the now impossible placement of the houses, but back in 1998 you could do this. I have been told that a one time you could mine from inside the house next to the mountain. *winks* So much mining was done here that there is a GM placed small forge and anvil behind the house next to the mountain. You will need use your circle of transparency to see them. Another of the small buildings in Dawn. This is dedicated to players who have passed on. This is but a small sampling of the delights to be had within the Kingdom of Dawn. Also to be found here is the Dawn Library housing an enormous collection of player-written and other books, The Royal Guard Jail and dozens of private workshops, houses, taverns and inns. On your own, feel free to explore the many surprises that make Baja’s greatest treasure the glorious Kingdom of Dawn!